Floating elbow is an injury pattern involving a fracture of the humerus and a fracture of the radius and/or the ulna in the same extremity. This injury may be associated with an elbow dislocation in patients who sustain high-energy injuries (see the image below). The location of the fracture may dictate the treatment options. Regardless of where the fracture occurs, if the elbow remains dissociated from the hand and shoulder, the fracture is deemed to be floating. Lateral radiograph of concomitant ipsilateral midshaft humerus and olecranon fractures. The landmarks for the humerus include the greater and lesser tuberosities, the deltoid tubercle, and the epicondyles distally. Proximally, the surgical and anatomic neck can define the humerus. The shaft of the humerus has two distinct grooves: proximally between the two tuberosities for the biceps tendon and posteriorly in the midportion for the radial nerve. A thin shell of bone separates the coronoid and olecranon fossae just proximal to the trochlea. The olecranon is the flared proximal portion of the ulna. It articulates with the trochlea at its semilunar notch. The ulnar contribution to the proximal radioulnar joint lies just lateral to the coronoid process, the radial notch. The proximal radius is composed of a concave disk-shaped radial head and a short narrow neck. 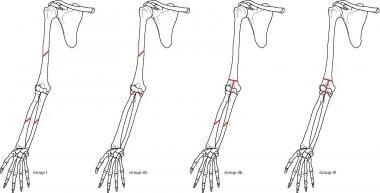 The ulnohumeral articulation is characterized as a hinge/ginglymus joint with 1º of freedom (flexion/extension). Its stability is enhanced by the congruence of the articular surfaces, as well as by the medial collateral and lateral ulnar collateral ligaments. The radiohumeral articulation functions as a pivot, allowing flexion, extension, and rotation. It is stabilized by the lateral collateral ligament and the annular ligament. The forearm is composed of the radius and ulna. Just distal to the radial head, the bicipital tuberosity lies on the anteromedial surface of the radial neck. The radius has a bow with an anterolateral convexity. This configuration must be restored to allow normal rotation about the forearm axis. The distal radius flares at the metaphysis to form a broad articulation with the scaphoid and lunate, with the radial styloid at the lateral margin of the distal articular surface. The Lister tubercle is palpable on the dorsal surface of the distal radius and is palpable between the extensor carpi radialis longus (ECRL), extensor carpi radialis brevis (ECRB), and extensor pollicis tendons. The ulna is triangular. It narrows and terminates in the distal ulnar head and styloid. The brachial musculature can be divided into flexor and extensor compartments. The flexor muscles include the biceps, brachialis, and coracobrachialis. The extensor compartment consists of the triceps with its medial, lateral, and long heads. The medial epicondyle acts as the origin of the forearm flexor muscles: the flexor carpi radialis (FCR), flexor carpi ulnaris (FCU), flexor digitorum superficialis (FDS), and palmaris longus (when present). The lateral epicondyle provides the origin for the extensor muscles (ECRL, ECRB, extensor carpi ulnaris [ECU], and extensor digiti minimi [EDM]) and the supinator and anconeus muscles. The axillary artery becomes the brachial artery as it passes underneath the pectoralis minor tendon. It then runs medially with the median nerve underneath the biceps brachii muscle. The profunda brachii branches at the junction of the proximal third and midthird of the humerus to run posteriorly with the radial nerve to supply the posterior compartment. The brachial artery runs down the arm, lying deep to the bicipital aponeurosis, anterior to the brachialis, and medial to the biceps tendon. The brachial artery, as well as the profunda, gives off a rich anastomotic network of vessels around the elbow as it moves toward the fossa. Here, it bifurcates into the radial and ulnar arteries. The radial artery crosses deep to the aponeurosis and superficial to the pronator teres and then continues deep to the brachioradialis between the artery and the FCR to the wrist. The radial recurrent is a branch from the radial artery that lies anterior to the lateral humeral condyle to anastomose with the radial collateral branch from the profunda brachii artery. The ulnar artery passes deep to the pronator teres and lies between the FDS and FDP proximally. Distally, it lies on the FDS between the FDP and the FCU. It gives off anterior and posterior recurrent arteries that surround the lateral epicondyle. The common interosseous artery branches from the ulnar artery in the proximal forearm; it immediately branches to form anterior and posterior interosseous arteries. The anterior component passes through the interosseous membrane near the wrist again to join its posterior component. The musculocutaneous nerve comes from the lateral cord of the brachial plexus. It pierces the coracobrachialis 5-8 cm distal to the tip of the coracoid and branches to supply this muscle, the biceps brachii, and the brachialis. The continuation of this nerve distally serves sensory function as the lateral antebrachial cutaneous nerve. The radial nerve comes from the posterior cord of the plexus. It enters the posterior compartment through the triangular space between the long head of the triceps and the humerus. It spirals around the humerus from medial to lateral while supplying the triceps muscle. It then pierces the intermuscular septum and emerges between the brachialis and brachioradialis, passing anterior to the lateral epicondyle. After supplying the anconeus and mobile wad, the radial nerve branches beneath the proximal part of brachioradialis into its two terminal branches, the superficial radial nerve and the posterior interosseous nerve (PIN). The PIN passes under the supinator and eventually lies immediately dorsal to the interosseous membrane. It supplies the remainder of the extensor muscles in the forearm. The superficial radial nerve runs deep to the brachioradialis in the forearm and provides cutaneous sensation to the dorsum of the hand after exiting the forearm between the ECRL and the brachioradialis. The median nerve arises from the medial and lateral cords of the brachial plexus. It accompanies the brachial artery along the upper extremity. It does not supply any muscles or sensation in the brachium but does provide some fibers to the elbow joint. It passes through the antecubital fossa anterior to the medial epicondyle and deep to the bicipital aponeurosis, lying medial to the brachial artery in most of the population. The median nerve exits the fossa medial to the brachial artery and continues into the forearm, splitting the two heads of the pronator teres. It runs between the FDS and the FDP, supplying all of the superficial flexors of the forearm except the FCU. The anterior interosseous nerve is given off as the median nerve splits the pronator teres. It supplies the deep flexors of the forearm except for the ulnar half of the FDP, specifically the FPL and pronator anadratus. The ulnar nerve is the continuation of the medial cord of the plexus and stays medial to the brachial artery. This courses posterior to the medial epicondyle in its own groove. It provides no motor function in the brachium but does supply some fibers to the elbow joint. It enters the forearm between the two heads of the FCU, running distally between the FCU and the FDP. It innervates the FCU and the ulnar half of the FDP before entering the hand through the Guyon canal. The functional outcomes of these injuries vary in children and adult patients. Pediatric injuries historically have had better results than those of their adult counterparts, largely because of children's ability to remodel skeletal deformity with time. Yokoyama et al reviewed a series of floating elbow injuries in adults. Surgical management varied from case to case, but each fracture was managed with some type of operative intervention. All patients underwent standardized elbow evaluations, and a review of pertinent complications was included. They had 67% good or excellent results; the final elbow score did not correlate with timing of operation, concomitant neurovascular injury, or open fracture. Nonunions were present in four cases. All of these were fractures treated with unlocked intramedullary fixation. Pierce and Hodorski reviewed 21 cases and found that only had 28% good results, with residual neurologic dysfunction in more than 50% of their patients. Lange reported on their experience with seven patients, with three good, one fair, and three poor results. As advances in fracture fixation and understanding of the basic science of fracture healing have improved with time, so have the results of these devastating injuries. Ditsios floating elbow prognostic classification. They observed statistically poorer functional outcomes in fractures with intra-articular involvement, whether of the proximal forearm, the distal humerus, or both. Additionally, concomitant neurologic injury [17, 16] and nonoperative management [2, 18] have been found to predict statistically worse functional outcomes in multiple studies. Stanitski CL, Micheli LJ. Simultaneous ipsilateral fractures of the arm and forearm in children. Clin Orthop Relat Res. 1980 Nov-Dec. (153):218-22. [Medline]. Yokoyama K, Itoman M, Kobayashi A, et al. Functional outcomes of "floating elbow" injuries in adult patients. J Orthop Trauma. 1998 May. 12(4):284-90. [Medline]. Sarup S, Bryant PA. Ipsilateral humeral shaft and Galeazzi fractures with a posterolateral dislocation of the elbow: a variant of the "floating dislocated elbow.". J Trauma. 1997 Aug. 43(2):349-52. [Medline]. Simpson NS, Jupiter JB. Complex fracture patterns of the upper extremity. Clin Orthop Relat Res. 1995 Sep. (318):43-53. [Medline]. Viegas SF, Gogan W, Riley S. Floating dislocated elbow: case report and review of the literature. J Trauma. 1989 Jun. 29(6):886-8. [Medline]. Grant JCB, Basmajian J. Grant's Method of Anatomy: a Clinical Problem-Solving Approach. 11th ed. Baltimore, Md: Lippincott, Williams & Wilkins; 1989:387-406. Hoppenfeld S, deBoer P, Buckley R. Surgical Exposures in Orthopaedics: The Anatomic Approach. 5th ed. Philadelphia: Wolters Kluwer; 2016. Chaps 2 & 3. Bhuller GS, Hardy AE. 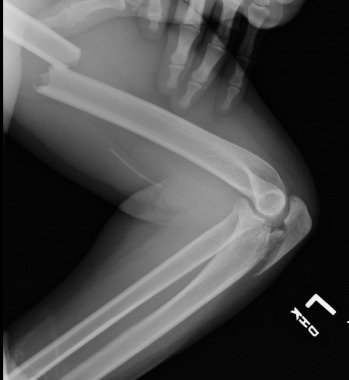 Ipsilateral elbow and forearm injuries in children. Aust N Z J Surg. 1981 Feb. 51(1):65-8. [Medline]. Harrington P, Sharif I, Fogarty EE, et al. Management of the floating elbow injury in children. Simultaneous ipsilateral fractures of the elbow and forearm. Arch Orthop Trauma Surg. 2000. 120(3-4):205-8. [Medline]. Papavasiliou V, Nenopoulos S. Ipsilateral injuries of the elbow and forearm in children. J Pediatr Orthop. 1986 Jan-Feb. 6(1):58-60. [Medline]. Templeton PA, Graham HK. The ''floating elbow'' in children. Simultaneous supracondylar fractures of the humerus and of the forearm in the same upper limb. J Bone Joint Surg Br. 1995 Sep. 77(5):791-6. [Medline]. Gebauer M, Barvencik F, Mumme M, Beil FT, Vettorazzi E, Rueger JM, et al. Microarchitecture of the radial head and its changes in aging. Calcif Tissue Int. 2010 Jan. 86 (1):14-22. [Medline]. Black WS, Becker JA. Common forearm fractures in adults. Am Fam Physician. 2009 Nov 15. 80(10):1096-102. [Medline]. Güven M, Akman B, Kormaz T, Poyanli O, Altintas F. "Floating arm" injury in a child with fractures of the proximal and distal parts of the humerus: a case report. J Med Case Reports. 2009 Sep 17. 3:9287. [Medline]. [Full Text]. Lange RH, Foster RJ. Skeletal management of humeral shaft fractures associated with forearm fractures. Clin Orthop Relat Res. 1985 May. (195):173-7. [Medline]. Ditsios K, Boutsiadis A, Papadopoulos P, Karataglis D, Givissis P, Hatzokos I, et al. Floating elbow injuries in adults: prognostic factors affecting clinical outcomes. J Shoulder Elbow Surg. 2013 Jan. 22 (1):74-80. [Medline]. Solomon HB, Zadnik M, Eglseder WA. A review of outcomes in 18 patients with floating elbow. J Orthop Trauma. 2003 Sep. 17(8):563-70. [Medline]. Rogers JF, Bennett JB, Tullos HS. Management of concomitant ipsilateral fractures of the humerus and forearm. J Bone Joint Surg Am. 1984 Apr. 66(4):552-6. [Medline]. Hwang RW, de Witte PB, Ring D. Compartment syndrome associated with distal radial fracture and ipsilateral elbow injury. J Bone Joint Surg Am. 2009 Mar 1. 91(3):642-5. [Medline]. De Carli P, Boretto JG, Bourgeois WO, Gallucci GL. Floating dislocated elbow: a variant with articular fracture of the humerus. J Trauma. 2006 Feb. 60(2):421-2. [Medline]. Ring D, Waters PM, Hotchkiss RN, Kasser JR. Pediatric floating elbow. J Pediatr Orthop. 2001 Jul-Aug. 21(4):456-9. [Medline]. Grace TG, Eversmann WW Jr. Forearm fractures: treatment by rigid fixation with early motion. J Bone Joint Surg Am. 1980 Apr. 62(3):433-8. [Medline]. Jones JA. Immediate internal fixation of high-energy open forearm fractures. J Orthop Trauma. 1991. 5(3):272-9. [Medline]. Moed BR, Kellam JF, Foster RJ, et al. Immediate internal fixation of open fractures of the diaphysis of the forearm. J Bone Joint Surg Am. 1986 Sep. 68(7):1008-17. [Medline]. Wallny T, Westermann K, Sagebiel C, et al. Functional treatment of humeral shaft fractures: indications and results. J Orthop Trauma. 1997 May. 11(4):283-7. [Medline]. Wallny TA, Wietoska I, Kastning S, Westermann K. [Functional fracture treatment of the forearm. The indications and results]. Chirurg. 1997 Nov. 68(11):1126-31. [Medline]. Monga P, Raghupathy A, Courtman NH. Factors affecting remanipulation in paediatric forearm fractures. J Pediatr Orthop B. 2010 Mar. 19 (2):181-7. [Medline]. Garg S, Dobbs MB, Schoenecker PL, Luhmann SJ, Gordon JE. Surgical treatment of traumatic pediatric humeral diaphyseal fractures with titanium elastic nails. J Child Orthop. 2009 Apr. 3(2):121-7. [Medline]. [Full Text]. Serra C, Delattre O, Dintimille H, Dib C, Rouvillain JL, Catonne Y. [Allograft-prosthesis composite arthroplasty for posttraumatic floating elbow]. Rev Chir Orthop Reparatrice Appar Mot. 2006 May. 92(3):269-74. [Medline]. Muchow RD, Riccio AI, Garg S, Ho CA, Wimberly RL. Neurological and vascular injury associated with supracondylar humerus fractures and ipsilateral forearm fractures in children. J Pediatr Orthop. 2015 Mar. 35 (2):121-5. [Medline]. Grade IIIA open ulna fracture in motorcyclist with associated radial head humeral injuries. Close-up of radial head dislocation with evidence of air in soft tissues. Initial management of Monteggia injury consisted of debridement and irrigation of extensively contaminated ulna fracture and application of external fixator for stability and reduction of radial head dislocation. Humeral fracture was splinted. Definitive management of fractures was performed with plate fixation.